[138 Pages Report] The GDI System Market for automotive is driven by the demand for fuel-efficient vehicles with high power. However, increased power output can decrease the fuel efficiency of the engine and increase tailpipe emissions. The existing emission standards (such as Euro 5 & 6 in European countries) have reduced the tailpipe emission limits. Gasoline direct injection is an advanced technology that injects highly pressurized (200 bar) fuel directly into the combustion chamber to improve the fuel efficiency and performance boost. The Gasoline direct injection market is estimated to be USD 4.60 Billion in 2016 and is projected to reach USD 11.28 Billion by 2025, at a CAGR of 9.94% from 2017 to 2025. The research methodology used in the report involves various secondary sources such as Society of Indian Automobile Manufacturers (SIAM), European Automobile Manufacturers' Association (ACEA), the International Council on Clean Transportation (ICCT), and paid databases and directories such as Factiva, Bloomberg, and Hoovers. Experts from related industries and suppliers have been interviewed to understand the future trends of the Gasoline direct injection market for automotive. The bottom-up approach has been used to estimate the market size, in which country-wise vehicle production statistics have been taken into account for each vehicle type. To arrive at the market size for Gasoline direct injection, the average installation rate of Gasoline direct injection in automobiles has been multiplied with the gasoline vehicle production of that particular country to get the market volume. The market size, in terms of volume, of Gasoline direct injection of each engine type (I3, I4, V6, V8, and Others) is then multiplied by the average OE price (AOP) of the particular engine. This gives the market size, in terms of value. The summation of the country-wise market gives the regional market, and further summation of the regional market provides the global Gasoline direct injection market. The below figure shows the break-up of the profile of industry experts who participated in primary discussions. the gasoline driect injection ecosystem consists of manufacturers such as Robert Bosch (Germany), Denso (Japan), Delphi (UK), Continental (Germany), Magneti Marelli (Italy), Cosworth (UK), Stanadyne (US), Keihin (Japan), Park-Ohio (US), Autocam (US), Hitachi (Japan), Renesas (Japan), TI Automotive (UK), UCAL (India), Hyundai Kefico (Korea), Carter (US), GB Remanufacturing (US), Nostrum Energy (US), Westport (Canada), and Hi-Vol (US). It also includes OEMs such as Volkswagen (Germany), Daimler AG (Germany), Ford Motor Company (US), Hyundai Motor Company (South Korea), Toyota Motor Corporation (Japan), Tata Motors (India), Mahindra & Mahindra Ltd (India); and equipment manufacturer associations such as Automotive Component Manufacturers Association of India (ACMA), Japan Automotive Manufacturers Association (JAMA), European Automobile Manufacturers' Association (ACEA), and Canadian Vehicle Manufacturers' Association, among others. The gasoline direct injection market is projected to grow at a CAGR of 9.94% during the forecast period, to reach USD 11.28 Billion by 2025 from USD 5.29 Billion in 2017. The market is estimated to grow in the near future owing to benefits offered by the Gasoline direct injection such as an increase in fuel efficiency, reduction in tailpipe emissions, and a drastic reduction in engine size without sacrificing the engine power. The demand for Gasoline direct injection is also projected to be driven by the increasing demand for HEV and PHEV vehicles and high-pressure fuel injectors in the near future. The study segments the Gasoline direct injection market by engine type. The I3 engine market is estimated to grow at the highest rate during the forecast period owing to its benefits such as better fuel efficiency and lower emissions. In addition, it is cheaper as compared to bigger engines such as V6 and V8. The I4 engine is estimated to hold the largest market share owing to its huge traction in regions like Asia Oceania and Europe. 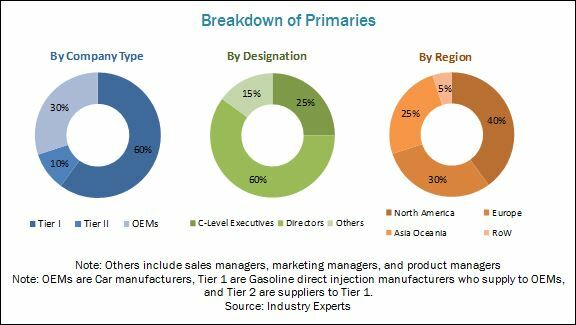 The study segments the Gasoline direct injection market, by component, into fuel injectors, ECU, sensors, fuel rail, and pump. The sensors market is estimated to be the fastest growing market during the forecast period. In the near future, the number of sensors used in the engine is expected to increase for better efficiency of the engine. The engine control unit (ECU) is estimated to be the largest market owing to the high cost of the unit and its importance in engine operation. The Gasoline direct injection market is also segmented, by hybrid vehicle type, into HEV and PHEV. The PHEV market is estimated to be the fastest growing market for Gasoline direct injection owing to rapid development in charging infrastructure and government support. The HEV market is projected to have the largest market share during the forecast period. The study segments the Gasoline direct injection market, by vehicle type, into hatchback, sedan, SUV/MPV, pick-up trucks, and coupe. The hatchback vehicle market is estimated to be the largest and fastest growing market for Gasoline direct injection during the forecast period. The market growth in this vehicle segment can be attributed to the low cost of the vehicle, increased engine power, and better fuel economy. The study also considers the market for gasoline turbocharger and gasoline particulate filter market for Gasoline direct injection, by region. Gasoline turbocharger and gasoline particulate filter are supportive technologies for the Gasoline direct injection. Asia Oceania is expected to play a key role in the gasoline turbocharger market, and it is expected to be the largest market. North America is expected to be the fastest growing market for gasoline turbocharger due to a high preference for gasoline vehicles and increasing trend of Gasoline direct injection. The gasoline particulate market for Gasoline direct injection is expecting a major push from the European market due to Euro 6 emission norms. Asia Oceania is expected to be a significant market for gasoline particulate filter in the near future due to the forthcoming emission norms equivalent to Euro 6. Asia Oceania is estimated to be the fastest growing market, by value, for Gasoline direct injection during the forecast period. 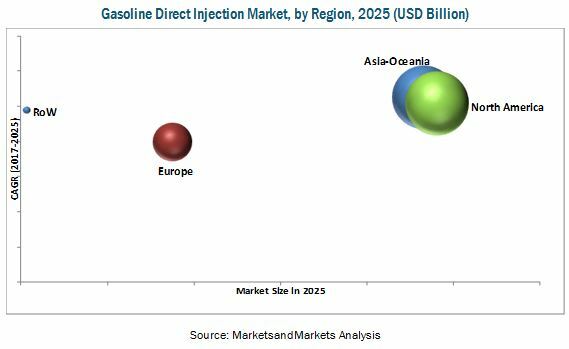 The growth of the Gasoline direct injection market in the region has been observed due to an increased focus on fuel economy, reduction in CO2 emissions, and increasing demand for high-performance vehicles. North America is estimated to be the largest market, by value, during the forecast period. The market growth in North America can be attributed to CAFE regulations, the trend of engine downsizing without losing the engine power, and strict emissions norms that ultimately increase the application of Gasoline direct injection in vehicles. The major factor hindering the growth of the Gasoline direct injection market is the high cost of the technology as compared to other injection technologies such as port fuel injection. Gasoline direct injection manufacturers have adopted the strategies of new product development and geographical expansion to gain traction in the Gasoline direct injection market. The key market players are Robert Bosch (Germany), Continental (Germany), Delphi (UK), Denso (Japan), and Magneti Marelli (Italy). *Details on Business Overview, Recent Financial, Products Offered, Recent Developments, Might Not Be Captured in Case of Unlisted Companies.